Stealth has always been obsessed with tennis balls. From the time I adopted him six years ago, his big joy in life has been to chase and retrieve tennis balls. Most Greyhounds love stuffed animals. Not Stealth. He much prefers any type of ball. As a placement representative for Greyhound Pets of America/California Adoption Center, Stealth and I make many home visits. I warn the people we visit that if there’s a tennis ball hidden somewhere in their yard, Stealth will find it. Sure enough, as the people laugh at the idea of a Greyhound finding a hidden tennis ball, Stealth will appear with the tennis ball in his mouth! Some people at my firm were involved in the “Flying Colors” flyball team. After meeting Stealth at work1 and seeing his ball obsession, they suggested he had the makings of a great flyball dog. 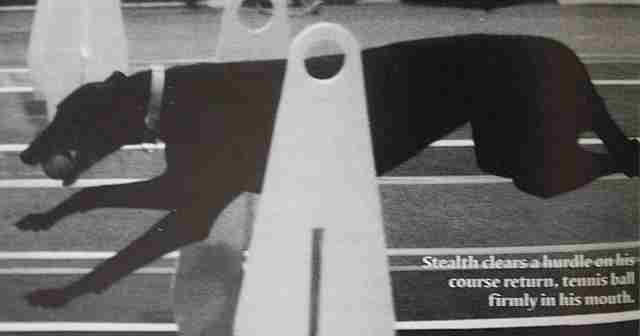 Since Greyhounds are fast studies, Stealth caught on quickly. And since all the practices and tournaments were in fenced-in areas, I felt this was a safe sport for us to pursue. Flyball involves relay teams made up of four people and their four dogs. The course is 102 feet from start to finish, with eight- to 16-inch hurdles along the way. The first dog in the relay lineup jumps the hurdles while he races to the end of the course, presses a springboard box to release a tennis ball, snatches the ball, then races back over the hurdles to his owner. As soon as the first dog completes the round trip, the second dog is released. A dog and a team will be penalized if the dog drops the ball at any time while in the lane or does not successfully complete any of the hurdle jumps. The first team to have all four dogs finish the course without error wins the heat. Flyball requires patience, endurance, and consistency on the part of both the owner and the dog. As you may have already guessed, it also takes speed; the faster each dog completes the course, the better the overall team time will be. No problem for a Greyhound, you’re probably thinking. Wrong. Greyhounds are long; the turns are tight  not a naturally winning combination. Flyball is a game all dogs and their owners can enjoy; however, some breeds come to the game more naturally than others. Border Collies, for example, are often called the perfect flyball dog. The characteristics inherent in this working breed, plus the Border’s ability to turn quickly and sharply, enhance the breed’s ability to excel at the sport. Even though Greyhounds are potentially 45-mile-an-hour athletes, they’re long dogs. The turn required at the box is a tight one  for a long-bodied, long-legged Greyhound; it’s a very tight one. It’s also not a natural thing for them to do. I found that if I didn’t catch Stealth’s eye and get him focused as he was turning off the box, he would take such a wide sweep that he couldn’t make the hurdles coming back. But all the time and hard work Stealth and I have put into flyball have paid off. Three days before his ninth birthday, and at his first tournament, Stealth, the Greyhound, landed the title of Flyball Dog Excellent and immediately ranked as the fifth flyball Greyhound in North America. Stealth is the hero of our Flying Colors flyball team; he’s the first dog on the team to have placed fifth in a breed classification. Flyball demands almost as much of the owners as it does from the dogs. Our enthusiasm and energy drive our dogs. The sport is great fun for the dogs; a wonderful opportunity for people to have a good time with their dogs, and just as important, flyball brings an owner and his dog closer. When Stealth is playing flyball, he’s doing something he loves and I’m sharing that time with him. Flyball exercise keeps him in shape and in good health. Best of all, it’s one more thing we can do together. I’ve very proud of my boy, Stealth, the flyball Greyhound. 1 This firm allows employees to bring their dogs to work as long as the dog has a CGC (Canine Good Citizen) certificate.